RadNet’s Musculoskeletal MRI Fellowship is one of the ways we lead radiology forward. Our renowned experts bring best practices to a new generation of physicians. Under the direction of Drs. 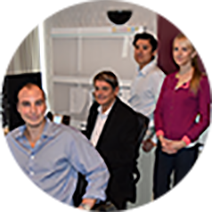 John Crues, Charles Ho, John Jurgutis, Ashwin Prabhu, and David Stoller, the RadNet fellowship prepares radiologists with an interest in musculoskeletal MRI for an academic or private practice career. Through the RadNet teleradiology network, fellows will gain experience with diverse cases from studies performed on both high- and low-field MRIs. The fellow will also have the opportunity to work with other distinguished radiologists in abdominal, neuroradiology, and PET/CT at the same location during the course of the year. A high volume of musculoskeletal MRI cases are drawn from multiple sites in the RadNet teleradiology network. This includes multiple orthopaedic/sports medicine and rheumatology groups. The fellow will gain experience with high field, 1.5/3.0 Tesla MR studies as well as low-field 0.2 to 1.0 T extremity scanners (E-Scan and C-Scan, ONI, MagneVue). Additional experience with Neuroradiology, Abdominal Imaging, Breast MRI, and PET/CT Imaging is available, depending on degree of fellow's interest. Fellows are required to attend daily lectures given by Dr. Crues covering MSK-MRI and MRI physics throughout the year. Fellows gain experience in specific areas during rotations, including joint arthrography and interventional procedures at RadNet clinics in Southern California and orthopedic and arthroscopic clinical with Dr. Kevin Stone at the Stone Clinic in San Francisco. Rotations in neuroimaging, head and neck imaging, and body imaging are also available.